We've been following the progress of designer and blogger Abbey Hendrickson as she undergoes a DIY renovation of her New York farmhouse. You might remember from our last installment, Hendrickson has tackled the outdated kitchen, revamping it into an open and airy space. Now, she's moved on to the half-bathroom. Like the kitchen, the bathroom's main issue was mainly one of outdated design choices (like the faux wood wall paneling). But the biggest issue? Its tiny size. While one option is to add a window, which makes any room feel more open. But the other, more budget-friendly option? Go bold with a graphic dark-navy-and-white scheme that would be too 'much' in a bigger room. We caught up with Hendrickson to find out her secrets to creating such a great look on a budget. Stylelist Home: Why did you settle on a dark hue for the wainscoting? Hendrickson: We started with white and didn’t like how it looked with the fixtures. Since we already had a few cans of navy blue paint around the house, I just gave it a try and we really liked it. It’s definitely not everyone’s cup of tea, but given the fact that every other room in our house is painted white, we like the unexpected contrast. What was the easiest change you made in the bathroom? The easiest change was the removing the old paneling. I took it out late one night while my husband was working on a different project. He wasn’t thrilled with yet another project, but I couldn’t help myself -- it was filthy and hideous. My husband would say the worst part was installing the drywall, which he installed himself. For me, the biggest challenge was the wallpaper. I had never wallpapered before, so that made thins interesting. The bathroom is also really small -- a tricky space to maneuver in with an armload of wet wallpaper. Do you have any words of advice for those who want to hang wallpaper? I watched several YouTube videos that were helpful. Having the right tools was also important. The wallpaper we used is vintage and didn’t come pre-pasted. Panic ensued towards the end as I started to run out of glue. Trust me, you don’t want to see a girl freaking out over wallpaper paste. Things got a little ugly and tears were shed. Do you have any tips for shopping Habitat ReStore? We’ve always had great luck with the Habitat for Humanity ReStore. My advice is to be patient and go to the store often. You may not find exactly what you’re looking for the first time, but you may find some other incredible piece. You can even ask the salespeople to contact you when a specific piece comes in. We’ve found several fixtures for our house that would’ve been cost-prohibitive at a big box store. It’s been a great resource. How did you find the school surplus auction? We had attended a school surplus sale at an area college and just happened to note the name of the auctioneers. The site we’ve had the most luck with is called Auctions International. I’d also suggest contacting your local school or college directly- sometimes they have surplus sales and you can scoop up some awesome old furniture. 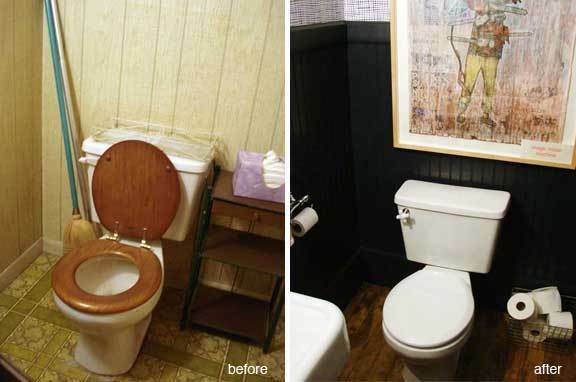 To see more of Hendrickson's bathroom makeover, click through the slideshow below. And for more details about the renovation, visit Aesthetic Outburst.